← Is Self-Marriage a Fluke? I took up tennis a few years ago. I’m a slow learner, but it’s a great hobby for exercise and stress relief, not to mention relationship tips. This week our instructor taught us how to be the perfect doubles partner. Some of us remarked that many of the same attributes on the court are critical in marriage. 1. Communicate more—On the court, it’s easy to let a ball whiz between you while wondering which of you is going to get it. Any hesitation or confusion, and you’ve lost the point. In marriage, we often assume we know who should do what and when. We assume we know how our partner feels or what their preferences are. We are probably wrong far more often than we realize. 2. Back each other up—Sometimes I think I can get to a high ball, but when my partner backs me up, there’s reassurance that if I can’t reach it, my partner will save us. In marriage, we often have to cover for one another, to be supportive and to catch the things that get dropped. 3. 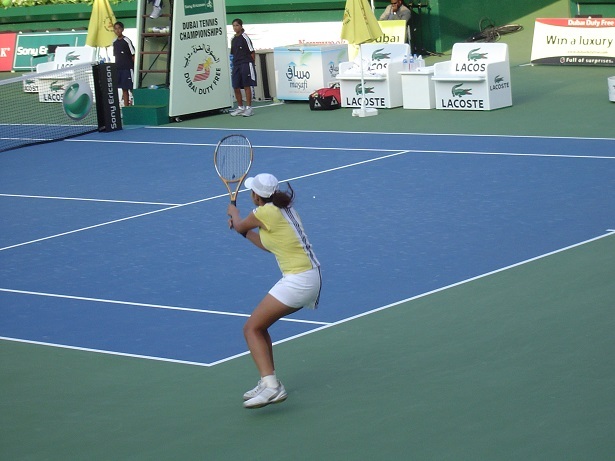 Help clean up the other’s messes—When I hit a ball to the volley player instead of deep and cross court to my opponent at the baseline, I put my partner at risk on the court. But if she moves to a defensive position when she sees my mistake, she may be able to clean up the mess and get us on track. If I apologize, she acts as if it’s no big deal. A partner who constantly gripes about how I put her in a bad position and made things hard for her wouldn’t be fun to play with. In marriage, let’s face it, we often have to clean up each other’s messes, both literally and figuratively. We should do so without resentment and griping, because, hey, we’re a team. 4. Move together—When I run to the edge of the court to reach a ball, my partner moves with me to cover the middle of the court, and I do the same for her. We are instructed to move together “like we are on a string.” In marriage, we also need to move together, grow together, stick together. When we get too far apart, each going on separate tangents and not inviting the other along, the marriage gets distant. Intimacy is lost. It’s more fun to share the journey, and it protects the relationship when we are connected. 5. Build one another up—When we’re losing a match, it’s easy to get down on ourselves. Negative self-talk occurs audibly on the court. But a good partner helps you shake it off, gets you refocused, helps you take a deep breath and start again. Same goes for marriage. There are really, really bad days we have to get through. And sometimes we screw up or feel as if we failed. We need that personal cheerleader who comes to our side, even if just to share in our sadness if things don’t go as we had hoped. 6. Love-Love—Remember each game starts this way, with a score of zero (love) to zero (love). Let each day start and end with love-love from each of you. Now, if anyone could help improve my serve, I would be most obliged. This entry was posted in Love, Marriage, Relationships and tagged be a perfect partner, better marriage, keys to a lifelong marriage, lifelong marriage, Love, marriage tips, Relationships, tennis and marriage. Bookmark the permalink. Loved the analogies here! All are so true (in tennis and in marriage 😉 ). Good point, thanks! Patience is always a tough one for me. Nice one Lori. (Especially after having read just a bit too much of all the Phil Roberton controversy fiasco 😳) It’s always good to focus on love and our relationships. #5 is my fav. I think doing that well helps to strengthen the other good points. Thanks, Kyle. You’re right about #5 helping the other aspects of the relationship. Sometimes it’s hard to stay positive. Doesn’t criticism come too easily?! Merry Christmas to you as well–and to the family.